This shot was taken right in front of the Indiana Jones Epic Stunt Spectacular, in Hollywood Studios. 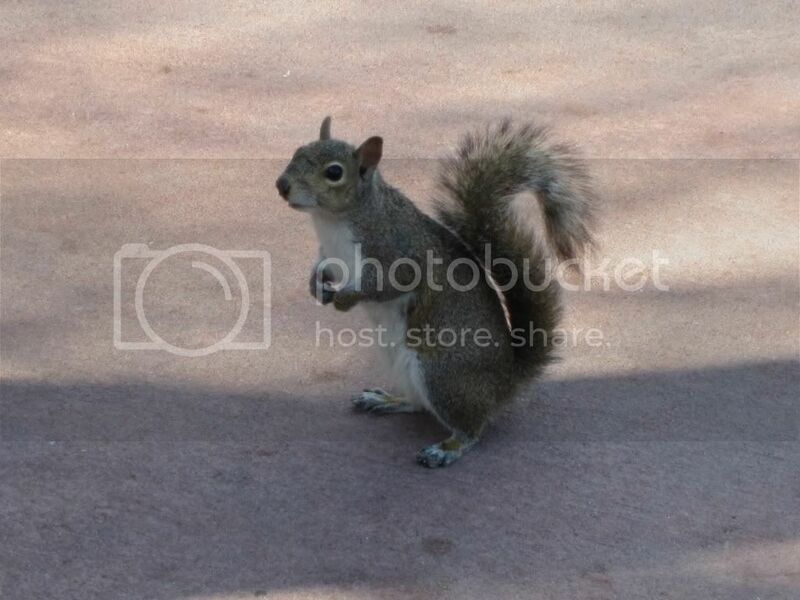 Squirrels are very friendly in the parks. They get much closer to humans than I've seen anywhere else. This is probably because the are around large amounts of people on a regular basis. Many of these people give them food, which makes them even more friendly! 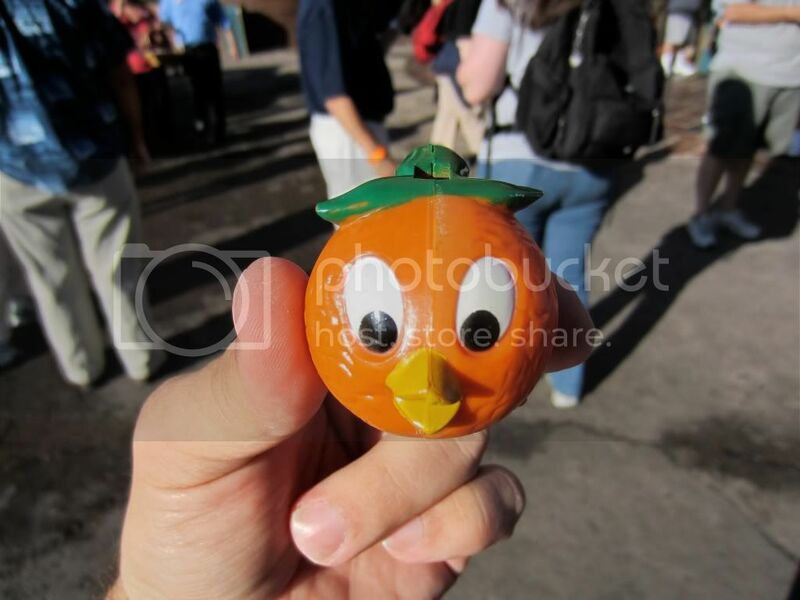 This is the Little Orange Bird whistle that had just been awarded me after I answered a trivia question correctly at the D23 event held back on April 17th. This event was held in the Magic Kingdom to announce the return of the Little Orange Bird to the Sunshine Tree Terrace in Adventureland. Imagineer Jason Grandt gave me the "little" prize after I answered his trivia question about the year the character was created. This was a fun event and it was great to meet several Disney Imagineers that day. This shot of Beast Castle was taken last week. This area of the Magic Kingdom is still very much under construction and still months away from completion. However, the castle itself looks to be almost complete. Beast Castle is much smaller than Cinderella Castle and it certainly uses forced perspective to give it a larger appearance. It sits on top of a large amount of rock work which houses the gallery, ballroom, and "west wing." When it is completed, it will be a quick service restaurant for lunch and a table service dining room for dinner. Most of new Fantasyland should be open by the end of this year. I know I'm looking forward to it! The Dapper Dans are a very talented barber shop quartet that entertain guests at the Magic Kingdom on a daily basis. On our most recent trip, we were lucky to meet up with them near Cinderella Castle for a picture. They are very friendly and always happy to pose with guests. Often times you will see them serenading passengers on the horse drawn trolleys that travel up and down Main Street, USA. They are also a part of the flag retreat ceremony that takes place every afternoon. The next time you are in the Magic Kingdom, be sure to stop and enjoy a few tunes sung by the Dapper Dans. This shot of the Avengers monorail was taken only about a week after it debuted. I was standing in front of the entrance to Bay Lake Tower when I took it. Like the "Tronorail," which was used to promote the movie Tron Legacy, the Avengers monorail is promoting this Marvel film that is coming out on May 4th. A few years ago, we wouldn't see anything related to Marvel anywhere on Disney property, let alone a billboard made out of a monorail. However, since Disney purchased Marvel in 2009, we are slowly seeing the infusion of this comic book franchise into the Disney parks. Since Universal Studios still currently has the rights to theme park attractions like The Amazing Adventures of Spider Man and the Incredible Hulk Coaster, we won't be seeing them make their way down I-4 in the near future. However, it won't be long before we see Marvel rides showing up in Disney theme parks around the world. For now, it is fun to see this eye catching monorail make its way around the Seven Seas Lagoon. I shot this photo of Test Track on April 15th at around 9:30 pm. You can see that there are no people in this picture as the ride and the park were closed. I was fortunate to be on the last ride before Test Track closed for a major refurbishment. This attraction has been around since 1999 and it will change from its "test" theme to more of a "design" theme. The basic track will remain unchanged, but the overall attraction will be much different when it reopens in the fall. Winter Summerland is one of two mini golf complexes at Walt Disney World. It is located right next to the Blizzard Beach Water Park and has a Santa and his elves theme. There are actually two courses here, one with a snowy theme and the other based on the beach. We played the beach side last week and you can see from this photo that our little guy had fun crawling on this huge sandcastle. Just as you'd expect from Disney, Winter Summerland is unlike any other mini golf course you've ever seen. It has been way too long since my last modern technology article. I have been on an extended "research" trip to Walt Disney World, and I finally have time to sit down and write about an interesting event that I attended in the Magic Kingdom. Although the event was great, it was the way that I was notified about it that applies directly to the theme of Digital Disney World. The event was an exclusive "Tweet Meet" for members of D23, the official Disney fan club. The term "Tweet Meet" is Disney's version of a "Tweetup." These terms are very new and have come out of the explosive growth of Twitter, the online social networking service. 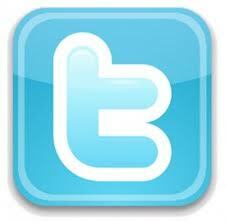 Tweetups occur when a person or group organizes a live gathering through the use of their Twitter account. I have written several articles about Twitter and how it is a great way to stay connected to official and unofficial info related to Walt Disney World. You can even follow me @DigitalDisWorld to get blog updates. The tweet that notified me of last week's Tweet Meet came from @DisneyD23, which is the official Twitter account of D23. Most of us who use Twitter have our smartphones set to alert us of new tweets. On Monday, April 16th, I received the alert that D23 was holding this Tweet Meet on the very next morning in Adventureland. It was limited to a maximum of 65 people and you had to respond to the tweet if you were interested in attending. I was at the Animal Kindom Lodge doing some work on my balcony, when I quickly responded to the announcement. About an hour later, I was excited to be notified that I was one of the first 65 to reply, and I would be attending the event on Tuesday morning. We were told to meet at the Magic Kingdom at 8:00 am, a full hour before the park opened. I arrived a few minutes before 8:00 and met up with my friend Amy Petermann, from The Relocated Tourist blog. After getting our wrist bands, we walked into the Magic Kingdom and congregated with the other D23 members on the bridge to Adventureland. There were several notable members of the Disney World online community there, including Lou Mongello from WDW Radio and Deb Wills from AllEars.Net. At around 8:30 we were all led down to the Sunshine Tree Terrace and told to expect some surprises. When we arrived at the Sunshine Tree Terrace, there was a stage and a sound system set up in front of it. This Tweet Meet wasn't just a gathering of D23 members, but also an event where a big announcement was to be made. After we were all comfortably situated in front of the stage, several Disney Imagineers took the stage to reveal that the Little Orange Bird was returning to Adventureland. Those of you who visited the Magic Kingdom back in the 70s and early 80s probably remember this bird. In addition to being a walk around character, a miniature version of him could be seen above the counter and on the sign of the Sunshine Tree Terrace. Although the walk around version has not returned, the Little Orange Bird was back on his perch in the Terrace. He is also present in new merchandise, including sippy cups and tee shirts. This D23 Tweet Meet was a great event. Not only did we get to witness a little history with the return of a classic character, but it was also an enjoyable social gathering. It was great hanging out with old friends like Amy and Lou, and it was a real pleasure meeting and speaking with Disney Imagineers, including Jason Grandt. The most significant aspect of this "Tweetup" is that none of us would have been there if it wasn't for the use of this very modern technology. Twitter is not only a great way to communicate information between like-minded people, but is now becoming a popular way to bring people together in person. This picture of the Uzima Springs Pool at the Animal Kingdom Lodge was taken last week. This is one of the largest pools at Walt Disney World. It has a nice pool bar, several hot tubs, and a fun water slide. Our little guy couldn't get enough of the water slide. The pool is adjacent to an animal viewing area as well as a playground. At night, they even showed Disney movies on a giant inflatable screen. If you are planning to spend a good amount of time at your resort when you come to Disney World, I would highly recommend considering this resort. The pool alone makes it a great choice! This photo was taken at the carousel section of the Saratoga Springs Resort on my trip in March. Disney always tries to make their resort themes as authentic as possible. One of the country's antique carousels is located in Congress Park in Saratoga Springs, NY. The horse seen in this picture is located near a gazebo with picnic tables in front of the resort. It is a nice shady spot to relax on a hot Florida day. This picture was taken near the Gorilla section of Pangani Forest Trail in Animal Kingdom last month. If you look at these crates you'll see that they have writing on them. One of them has the words "Confiscated Poacher Gear," carrying over the story from Kilimanjaro Safaris. This is another example of a detail overlooked by 99.9% of guests, but now you may notice it on your next trip! The Animation Gallery is located in The Magic of Disney Animation attraction at Hollywood Studios. It is essentially a gift shop, but it features some great Disney art. One of my favorite pieces is the one of Walt as a train engineer. Walt was a train lover and this painting shows him enjoying his hobby. This attraction and store is sometimes overlooked, but if you are a fan of animation or Disney art, I recommend checking it out. I was able to get this shot from the second floor of the Main Street Railroad Station on a trip in March. It was late at night and most of the guests had left. I love the way the Magic Kingdom looks at night. It is worth staying a little later to experience Main Street after the big crowds have left. The Kusafiri Coffee Shop and Bakery is just past Tusker House in Animal Kingdom. It is a great little spot to grab a coffee and a pastry. It amazes me how much detail that Disney puts into something as simple as a coffee shop. The whole area looks so authentic and you can momentarily believe you are in Africa. Rosie's Victory Garden is located next to Rosie's All American Cafe on Sunset Boulevard in Hollywood Studios. These gardens were common during the 40s as people were encouraged to grow their own food during the war years. There is a very obscure yet interesting reference in the "V" sign. The morse code for the letter V is present. It is shown as dot-dot-dot-dash. V is also the Roman numeral for the number 5. This morse code is derived from the opening of Beethoven's "Fifth" Symphony, which sounds like Di-Di-Di-Dah. This is just another one of those hidden gems that you can impress your friends with the next time you are at Hollywood Studios! This shot of Kali River Rapids was taken in March. This attraction, opening in 1999, is Disney Worlds first and only river rapids type ride. It is a fun ride with a conservation theme. You are guaranteed to get wet, so I suggest bringing a poncho if you'd like to stay reasonably dry. Although getting drenched feels great on a summer afternoon, you might not enjoy it as much on a cool January morning! Pizzafari is a quick service dining location on Discovery Island at Animal Kingdom. This colorful mural is located in the queue area. There are several dining areas in this large restaurant, each with its own unique, animal-based theme. If you are in the mood for some fast food Italian the next time you are at Animal Kingdom, definitely check out Pizzafari. Tatooine Traders is a large souvenir shop attached to Star Tours in Hollywood Studios. Star Wars fans can see from this shot that it is made to look like a structure that would actually be found on the planet of Tatooine. Like many attractions, the marketing geniuses at Disney made the ride exit right into the shop. It isn't easy to get young boys to leave the attraction without wanting to buy something at Tatooine Traders. In addition to all kinds of great Star Wars merchandise, guests can design and purchase their own light saber. The Hall of Flags is located in the American Adventure Pavilion at Epcot. It contains the 44 different flags that have flown over American soil. They are hanging over the escalators that lead to the second floor, which is where you enter the theater for the show. This is a must see pavilion, especially for anyone interesed in American history. This is a shot of the "Wilderness Explorers" Animal Kingdom Meet UP. Russell and Dug met with guests for a short time last December and have recently come back to stay. They are located right outside the entrance to "It's Tough to be a Bug" on Discovery Island. It only makes sense that more and more Pixar characters are showing up in the parks, considering the amazing success of every one of their movies. The British Revolution is a very good band that entertains guests at the United Kingdom Pavilion in Epcot. The play British rock music form the 60's up through the 90's. You can hear tunes from The Beatles to Led Zeppelin to The Police. This clip features the song "Live and Let Die," originally recorded by Paul McCartney and Wings. For those of you who think that Walt Disney World is only about Mickey Mouse and Princesses, check out this video recorded in March! This is a recent shot of the "new" Barnstormer - featuring the Great Goofini. It is one of the attractions that just opened in the new Storybook Circus section of Fantasyland. Although this ride uses the same track, it underwent a complete overhaul in theming. When this area of the Magic Kingdom was known as Mickey's Toontown Fair, the attraction was called The Barnstormer at Goofy's Wiseacre Farm. Whatever the name, this is a great intro coaster for younger kids. The Hollywood Brown Derby is the nicest of the table service restaurants in Hollywood Studios. The original Brown Derby was built in the shape of an actual Derby. However, this one was designed after the one that Walt Disney himself used to frequent. The chain of restaurants was started by Robert Cobb and Herbert Somborn. There is an interesting story about how Robert Cobb raided the refrigerator one night and chopped up some leftovers to make dinner for a friend. This was the creation of the famous Cobb salad, which you can order at this restaurant in Hollywood Studios. This is the pool in the Paddock section of the Saratoga Springs Resort. Formerly a "quiet pool," it was refurbished last year and transformed into a feature pool. It is considered "zero entry" where you can walk right in to a very shallow area. There is also a nice water slide as well as a kids splash pad area. You can grab a bite or even a cocktail at the Paddock Grill, which is right next to the pool. Saratoga Springs is a huge resort with a lot to offer. Although it is primarily for DVC members, it is open to non-DVC as well. This close up of the Tree of Life in Animal Kingdom shows some of the amazing artwork carved into the trunk. This manmade icon stands at 145 feet tall and contains over 325 animal carvings. It took over two years for the artists to complete the incredible task of forming these creatures into this structure. The engineering of the tree is also quite a marvel. It had to be able to stand up to hurricane force winds so they actually used a modified oil rig as the internal support for the tree. The next time you are at Animal Kingdom, I highly recommend walking on the Discovery Island Trails to get a close up view of the animal carvings. Back in June of 2011, I wrote an article about the Disney By The Numb3rs website. It is a great place to visit when you are looking for anything numerical related to the Disney parks and resorts. Whether you are searching for ride capacities, attraction sizes, or construction costs, DisneybytheNumbers.com is the place to go. 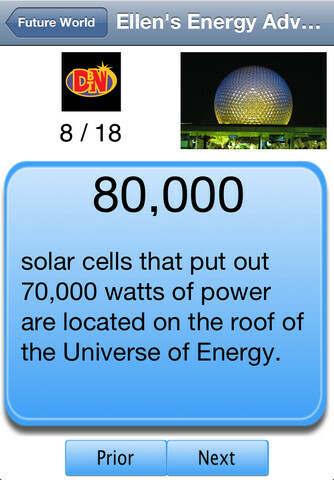 You can pretty much find any facts about Walt Disney World that include numbers. I use this site on a regular basis to look up information for articles that I write. The site's creator, Tony Caselnova, has recently taken Disney By The Numb3rs to the next level. He partnered up with Joe Fratianni who developed the corresponding iPhone app. 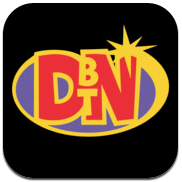 The Disney By The Numb3rs app, known as DBTN, came out on March 21st of this year. 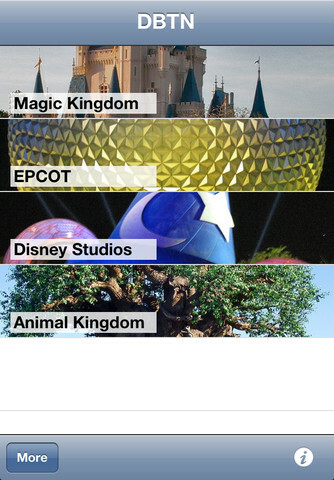 Now you can have all of the website's Walt Disney World numerical facts in the palm of your hand. It is a great app that is organized by park, by land, and finally by specific attraction. Whether you want to know what year an attraction debuted or how many ride vehicles it contains, this is an app you'll enjoy. It is great fun for trivia buffs or even just casual Disney fans. Another fun use for the DBTN app is to help pass the time while waiting in the lines at Walt Disney World. Instead of mindlessly shuffling through the hour long queue while waiting to ride Peter Pan's Flight, you can take out your iPhone and learn a little about the attraction. You can also amuse other people in line by showing off your newly acquired knowledge. For example, you could be the one to inform the guests around you that Peter Pan is a ride that lasts 2 minutes and 45 seconds. Actually, that may be a fact that you want to keep to yourself, especially if the people around you have been waiting for close to an hour! The DBTN app is an absolute "must have" for anyone who enjoys DisneybytheNumbers.com. For those who haven't seen the site, I'm happy to be introducing it to you. You can also read my article about the site here. Tony Caselnova is a Walt Disney World enthusiast who obviously enjoys bringing us interesting info about Walt Disney World, and he updates his website on a regular basis. Joe Fratiani is a talented app developer who has several Disney apps available over at iTunes. I recently reviewed his "Days to go WDW" app in an article I wrote back in March. Both Tony and Joe are very good at what they do and I highly recommend checking out the DBTN app. It is certainly worth the $.99 price tag! This video includes excerpts from the Festival of the Lion King show at Animal Kingdom. It was recorded in September of 2009. This show is definitely one of the best productions in Walt Disney World and is enjoyed by all ages. This live shot of Mr. Incredible was at the Magic of Disney Animation attraction at Hollywood Studios. This pavilion, which was originally a working studio, now features several different sections related to animation. There is a presentation that shows how an animated character is created, and also a place to learn how to drawn your own. There are several different character greeting spots. You can see Sorcerer Mickey and Winnie the Pooh in the large room, in addition to Mr. Incredible and Frozone in the Pixar area. Although the Magic of Disney Animation isn't one of the more popular attractions, it is certainly worth a visit on your next trip. At first, you look at this American Crocodile and think that it must be an audio animatronic figure. It is in DinoLand, an area of Animal Kingdom where there are no other live animals. Also, it sits perfectly still most of the time, and often has its mouth wide open. This very large reptile lives in a small grotto across from Restaurantosaurus. Most guests walk by without realizing that this "modern day dinosaur" is in this spot. You can usually find a cast member nearby to answer your questions about the crocodile. The next time you are in Animal Kingdom, I recommend checking out this large, yet overlooked, resident of DinoLand. The Epcot International Flower and Garden Festival features over 100 topiaries, including 75 Disney character topiaries, throughout the park. At the 2012 festival, you can find both Lightning McQueen as well as Mater over at the Japan Pavilion. This was a logical choice for placement of this Pixar duo as Japan was featured in last year's sequel, Cars 2. The Flower and Garden Festival is a great reason to visit Epcot in the spring. It adds a whole different dimension to enjoy while making your way through this already incredible theme park. This 1983 clip is from the original "Listen to the Land" attraction located in The Land pavilion at Epcot. This is back when they had cast members doing live narration. Although the attraction has changed over the years and is now called "Living with the Land," the basic premise is the same. The video starts out a little dark, but is a pretty good representation of this classic ride. Ok, so it's not too often that I post pictures of restrooms, but these are unique. This shot was taken last week on my first visit to the recently opened Storybook Circus area in the Magic Kingdom. This building is part of the new train station in Fantasyland, and houses the restrooms. The details of this "roundhouse" are amazing and add to the story of this new land. The new restrooms are also some of the nicest at Disney World. One detail worth noting is that the actual name of the train station is the Carolwood Park Station, paying homage to Walt Disney's personal 1/8 scale railroad located in his backyard, which was called the Carolwood Pacific. You can see two of the actual cars from that railroad on display over at the Wilderness Lodge Villas, one of the DVC resorts on property. This souvenir kiosk on Sunset Boulevard in Hollywood Studios is made to look like an old style trolley. It is reminiscent of the "Red Car Line" that was used in the 30's and 40's in Southern California. There are even electric lines that run overhead to help complete the story. There is a detail on this kiosk that is overlooked by 99.9% of the guests that walk by. You will see the number 694 in a couple of spots. This refers to the fact that Sunset Boulevard in Hollywood Studios opened in June of 1994. This is similar to the "Route 498" sign found over in Dinoland referring to the opening month and year of Animal Kingdom. This 2009 video features some of the highlights of "Finding Nemo - The Musical" at Animal Kingdom. The show debuted in 2007 and is one of the best productions in Walt Disney World history. It is not to be missed, especially if you are fans of the movie! Camp Minnie-Mickey is the area of Animal Kingdom where the Festival of the Lion King show takes place. It is also a place to meet Mickey and his friends. This shot shows a fun little scene where Mickey, Pluto and Goofy are doing some fishing. This entire area is designed to look like a camp in the Adirondack Mountains of upstate New York. The scenery is incredible and includes a river that truly resembles something you'd find in the northeastern area of the country. As usual, Disney does an amazing job at taking guests out of Central Florida and placing them into the story. Walt Disney World is so much more than just four amusement parks. As I've talked about extensively, they are referred to as "theme" parks for a reason. Disney likes to tell a story with everything that they do. This is not only true of the theme parks, but also the resorts, restaurants, and water parks. Today we celebrate the 17th birthday of Walt Disney World's newest water park, Blizzard Beach. 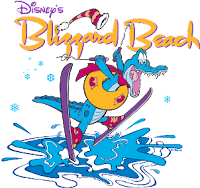 Blizzard Beach opened on April 1st, 1995 and became the third water park at Walt Disney World. Along with its sister park Typhoon Lagoon, Blizzard Beach is one of the top two most popular water parks in the world with nearly 2 million visitors per year. Disney World's first water park, River Country, opened in 1976 and has since closed. 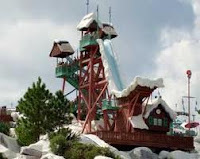 The notion of snow in Florida seems a little crazy, but it is a major part of how Blizzard Beach was created. As the story goes, there was a freak snowstorm at Disney World, leading to the construction of Florida's first ski resort. Obviously the snow didn't hang around long, but a collection of ski jumps and chair lifts were left behind. The parks mascot, "Ice Gator," was seen sliding down a flume into a pool of water and the ski resort was quickly turned into a water park. Blizzard Beach sits on 66 acres, which is very large by water park standards. It is home to some of the most unique water attractions to be found anywhere. The flagship attraction and park icon is Summit Plummet. It is the tallest and fastest free fall water slide in North America. It had the distinction of being the tallest and fastest in the world until the opening of Insano, at Beach Park in Brazil. Summit Plummet is 120 feet tall and guests reach speeds of 60 miles per hour lying on their bare backs! I rode this ridiculous attraction many years ago, and I am not sure that I'd have the courage to do it again. In addition to Summit Plummet, Blizzard Beach is also home to the longest "family white water raft ride" at 1,400 feet long. For less adventurous guests, there are many enjoyable attractions that don't get your adrenaline pumping. 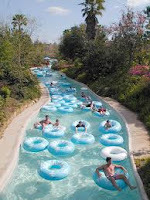 The Cross Country Creek is a 3,000 foot slow moving "river" that allows guests to float around on their own inner tube. It is a relaxing way to spend an afternoon. However, I will say that it is important to wear your sunscreen. A few years back, I fell asleep on the Typhoon Lagoon version of this lazy river, and talk about a bad sunburn! Blizzard Beach also has a one acre wave pool that is fed by "melting snow" that creates gently bobbing waves to enjoy. This water park really has something for everyone. Even if you don't feel like going in the water, but want to spend the day with friends or family, it still can be a fun place to hang out. You can pull up a lounge chair and work on your suntan or read a book. There are several good places to grab a bite to eat and even a couple of bars where you can enjoy your favorite drink. After seventeen years, this very popular water "theme park" continues to be a great place to spend a day at Walt Disney World. Happy birthday Blizzard Beach! 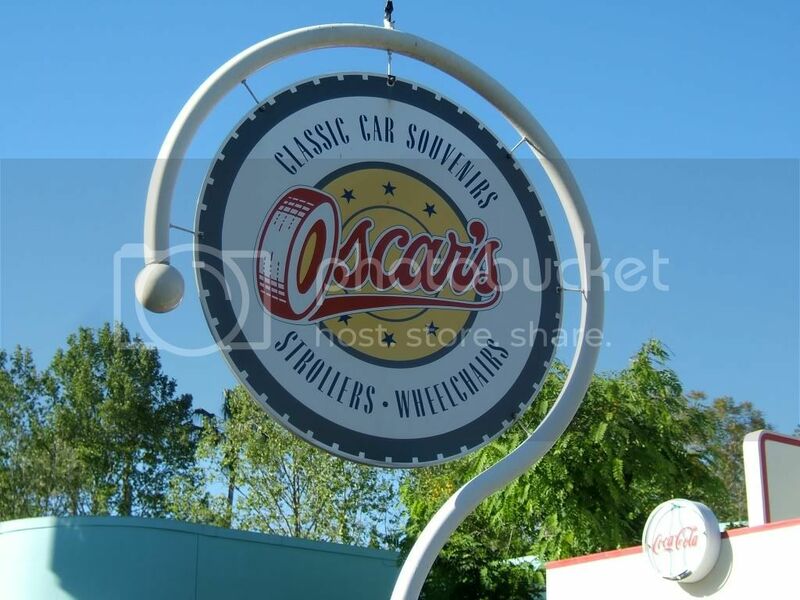 Oscar's is the stroller and wheelchair rental area located just inside of the gates at Hollywood Studios. Since Disney can't have a building without a theme, this area takes the form of a service station. It makes sense that the "wheeled" vehicles for rent would be picked up at a station that services vehicles. Also, the name Oscar's is no accident. It is an appropriate name to be be found in a park that is focused on movies!